Overcoming delays with rhythm and timing! Timing in the brain, or Neurotiming, is critical to speech, language and cognitive function. Timing is also the basis for attention, working memory and processing speed, all of which are critical for proper childhood development. Timing is considered a domain-general mechanism because it works across so many other functional networks. It is essential in proper communication between the brain’s functional networks. 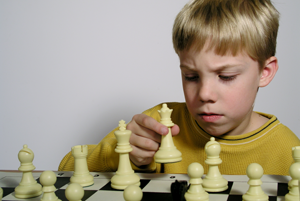 This timing in the brain has been shown to be deficient in several common conditions, including developmental delays. IM is the only training program that improves timing in the brain in an organized, systematic, flexible and engaging format. 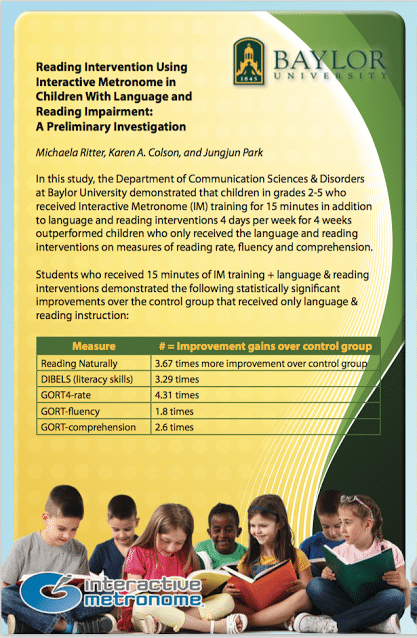 In fact, a study from Baylor University reveals that students who received just “15 minutes of IM training, four days a week” in addition to language and reading intervention, demonstrated significant improvement in reading rate, fluency and comprehension over students who just received language and reading instruction. That is how Peter made it work for him. His mother made sure that Peter did his training twice a week before school and in just a few weeks Peter was like a whole kid. He is now raising his hand in class, taking great notes and making friends at recess. At home, Peter’s family says they are most happy that he has come out of his shell and is now loving life. IM is a research-based training program that has been shown to improve deficits seen in those diagnosed with Developmental Delays. For help with DD and many related conditions, look for Providers with our “Academic” badge on our Provider Locator Board. Also, Providers with these badges have additional training for children from similar backgrounds and symptoms: Autism, Brain Injury/Stroke, Early Intervention, Innovative Pediatrics, Reading/Literacy, SPD/ADHD, Speech/Language, and Visual Processing.